Auntie Anne’s Pretzles are long and thin. Aunie Anne’s Pretzels can be found in shopping malls and airports everywhere. I find that the Auntie Anne’s Pretzels are irresistable. I would like to thank Adrienne for this one! Many, many thanks. Pretzels – make them just like they do with our recipe. Make Pretzels that taste just like Auntie Anne's in our opinion. After dough has risen, pinch off bits of dough and roll into a long rope (about 1/2 inch or less thick) and shape. Dip pretzel in soda solution and place on greased baking sheet. Allow pretzels to rise again. Bake in oven at 450 for about 10 minutes or until golden. Brush with melted butter and enjoy! Or for Auntie Anne's famous Cinnamon Sugar, try melting a stick of butter in a shallow bowl (big enough to fit the entire pretzel) and in another shallow bowl make a mixture of cinnamon and sugar. Dip the pretzel into the butter, coating both sides generously. Then dip again into the cinnamon mixture. Enjoy! Do I have to use bread flour? Can I use just regular flour completely? And does regular flour mean non self rising? Bread flour does work better than all-purpose flour. Yeast measurements are incorrect. I measured 1 1/8 teaspoons using measuring spoons and it was not even one full package of yeast. The dough did not rise nearly as much as it should have and the dough was very dry and hard to work with. I used to make these pretzels many years ago but don’t recall how much yeast I used at that time. Clearly, 1 1/8 teaspoons is not enough. I think there was a typo, I am sorry, it should have been 1 1/8 tablespoons. It sounds like if it was dry, you needed to have added some water. I am sorry I made a typo. Why not edit the recipe then to fix the typo? You are right I will do that now. Pretzels are my boyfriend’s favorite so I made these this weekend and they were delicious. We ate 3 immediately. 🙂 It’s the first time I’ve made pretzels…they came out so well I won’t have to try any other recipes. I made them a bit smaller I guess…my batch produced about 8 pretzels. I got tired of rolling so the last two I just made into little bun shapes with a couple of scores on the top and they cooked just as well as the pretzel shape on the same pan. As I was kneading, I thought I needed more liquid so was making a note to add more next time. However, they tasted perfect so I will not alter the recipe at all. I tend to make a recipe exactly the way is written the first time before deciding if it needs adjustments. This one is perfect for me and it will be used on a regular basis in my house! I will even change the shape and make some pretzel buns for my burgers! So happy I tired it. Oh, and they were super easy! It was the easiest baking I’ve done in awhile. Another fabulous plus! I should add, I used King Arthur’s Bread Flour & King Arthur’s All Purpose Flour for the regular flour. Once I’ve started using King Arthur (after Stephanie suggested) I haven’t gone back. I think King Arthur Flour is definitely amazing stuff. A Co-worker who used to bake all of the time would only use this flour, and it made a very large difference. I think I have been using it now for about 13 years. Love this flour. I think some of it is also the type of yeast that they use. If you can find SAF gold, it gives you a much sweeter bread. Kingarthurflour.com sells this brand online. This recipe is very good! Closest I’ve found to AA. I will say that I know AA’s uses clarified, unsalted butter. They also use more baking soda in the dipping mixture, it should be cloudy when mixed up. This dipping solution gives the pretzels their crispy golden crust. I made the recipe exactly as stated here and my pretzels weren’t as golden brown. Had I cooked them longer to achieve the darker color, they would have been hard. Also, for salted pretzels, shake on the salt right after dipping and before baking. The salt sticks much better this way. When I pulled mine out of the oven, the were a dark golden. I thought I had cooked them too long and they were going to be hard but they weren’t…they were cripsy on the outside & soft in the middle. I’m going to try your tip with the salt next time! We made this recipe and added raisins in our new breadmaker and boy, it was delicious!!! 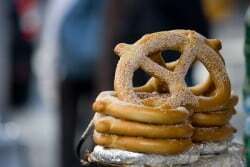 This is by far one of the best recipe for the aunt annes type pretzel. i have been using this recipe every couple of months or so with my kids. 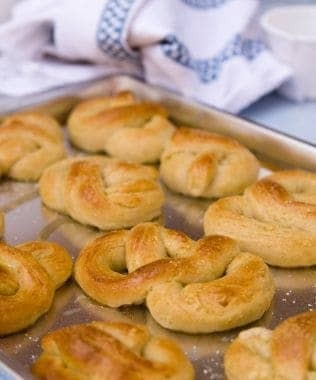 they absolutly love the pretzels that come out of the oven with this recipe. I use sea salt instead of pretzel salt. its much better for you and tastes just as great. and don’t forget LOTS of butter is required for that authentic aunt annes flavor. thanks again for sharing this wonderful recipe!! Great recipe. Very easy too. Mine were not as pretty as auntie annes. Next time I will portion out dough maybe 3oz each and then roll out to approx 24in before shaping. I only had 1pkg of yeast and the pretzels turned out fine. Fantastic! Just made a batch with the kids – another website suggested using ‘sweet butter’ (a little known secret) to cover all flavors of the pretzels. Tastes just like the real deal. what actually is “sweet” butter? It is another way of saying unsalted butter. Update to update: actually they turned out fine. Sorry for my overdramaticnes! If you salt the pretzels before, it’s amazing. When they’re done, take them out and butter them to death. They taste JUST like Auntie Ann’s. The baking soda water gives the pretzels that smooth, glossy outside. It’s just enough to get the outsides to have that sheen on them, but not enough to cook them all the way through. So once you bake them, you get a soft middle with the chewy exterior.. absolutely necessary! It’s the same step that gives bagels their smooth, shiny exterior. I’m curious about the baking soda water’s role, too. anyone? the soda water is suppose to give it the crispiness on the outside. It seems the baking soda water sets the pretzel, it seems like it molds them, I made these with the kit and it was awesome. After I baked them I put the pretzel in butter ( i had melted about 1 cup) and then rolled it in cinnamon, put it back in the butter and then in cinnamon again, oh it was GREAT!!!! I made these pretzels with my my Granddaughters and they are delicious. The dough is a very nice consistency and easy to work with. I am wondering what purpose the baking soda water bath serves but since the results were so good, it is a step I would not skip. Enjoy! I tried this recipe for the pretzels… I have to say they are delicious! Oh YUM! I also made some stuffed with cream cheese and Schwans makes. When I rolled the dough into strips, I flated it, put long skinny slivers of cream cheese in, then I folded dough back over and pinched wides and then continued rolling into long log. This is a really good recipe. I am curious though, was the purpose of dipping them in the baking soda water prior to baking? Hey, i want to know if i can fridge or freeze the spare dough. Thanks! I believe you can refrigerate the dough for later, but I am not sure how this would work out if you froze it. I LOVE AUNTIE ANEES PRETZEL STICKS! T HEY ARE AHHHHHH-MAZING!!!!!! I COULD EAT THEM ALL!